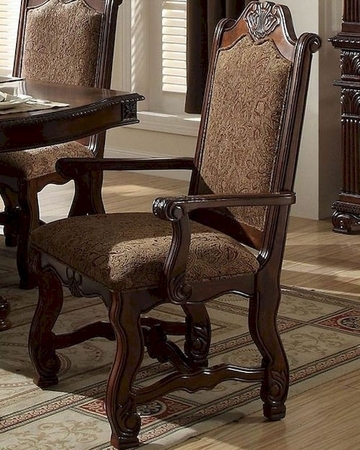 Stately in design and presence, the Thurmont Collection provides a timeless statement to your formal dining room. Acanthus leaf carvings provide a continuous theme throughout the collection -featured on the china, table and chairs. Cherry book-match veneer provides a classic look to the table top as do the elegantly curved legs. Routing is featured prominently on the accenting chairs, flowing with each curve. The chair backs have an overlay wood design that highlights the richly toned hues of the chair's fabric. Serving as a grand focal point, the china’s arched top and decorative beveled glass serve to display your tabletop accessories. Finally, a rich cherry finish adds to the overall design of the Thurmont Collection.